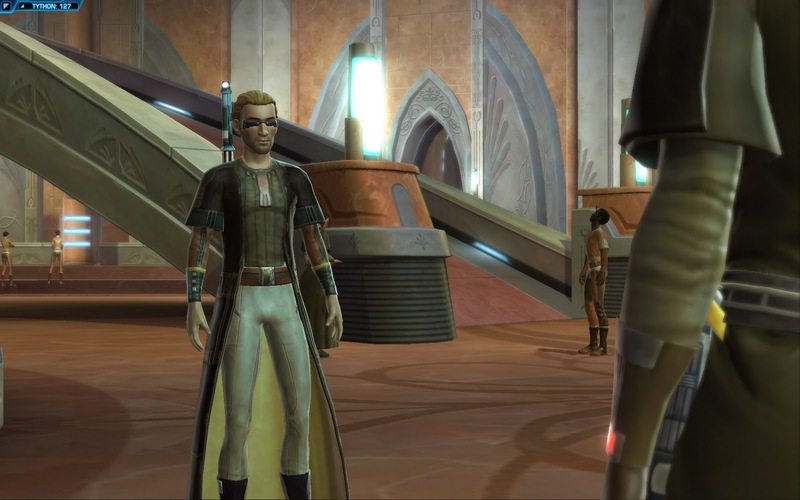 There was a large scale beta stress test for SW:TOR on the weekend, and I was fortunate enough to be able to participate. Testers have been told they can "freely talk about their experiences this past weekend within the game, as well as post screenshots and gameplay videos of their testing experiences". So, with that in mind, let's just into an appraisal of my experience. This follows about a four hour journey of my testing. After sitting through the excellent intro video that many people have already seen, I got presented with a server list... all of which were full. Picking one with the lowest wait time on the West Coast of the US, I did a few things while waiting to get a slot. Within a few minutes, I was logged on and ready to pick a side. After picking the Galactic Republic, I was treated to the "Hope" trailer before I got to select my class. Now, maybe it's just me, but I would have thought that anyone who is keen enough to participate in a beta will probably have already watched these videos, and even if they haven't they add little enough to the actual story of the game as it's presented to the player for them to actually matter. I might be nitpicking here over some nice eye candy, but as far as I was concerned, I didn't need to waste my time and download bandwidth on those videos. 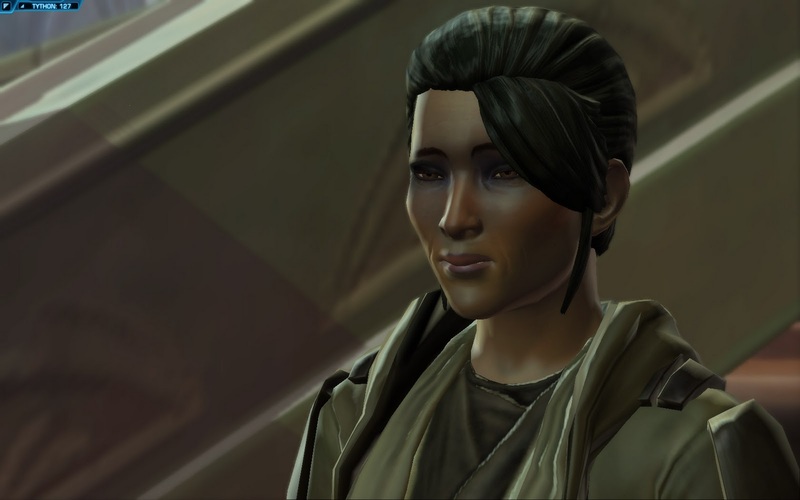 Regardless, I fired up the character creator and got to select my class (Jedi Consular), race (Miralukan - like Visas Marr), and then the usual character appearance customisation. This defined body & face shape, skin tone, hair style/color, scars and my "mask" (seeing as Miralukans are physically blind). Unlike many MMOs it actually appeared as though this appearance would help individualise the character, as I didn't see anything items that I'd be wearing over my head or obscuring those choices completely. Now, of course, there is the potential that people will create identical looking characters, but there seemed to be enough variation that you wouldn't have everyone looking the same. With my character created, I was treated to the classic Star Wars rolling text over space before being presented with a cutscene of my character turning up on a Jedi homeworld. First, let's talk about the visuals. It's not a mindbogglingly gorgeous game, and there were some texture issues like texture pop in dialogue/gameplay and generally low texture resolution. That said, it still looks okay, though I wouldn't be surprised if there are some improvements before the final release. The art design is clean and simple, going for a stylised appearance. To be honest, that's what I've come to expect of an MMO. 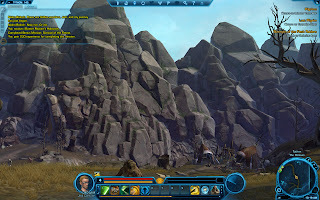 Having to deal with high resolution graphics along with the overhead of an MMO is something that modern computers can do, but an MMO has to market to as many people as possible and targeting the enthusiast PC market doesn't mesh with that aim. I didn't really have any "wow, that looks awesome" moments in terms of scenery, but to be honest I don't think I've ever got that within the first four hours of an MMO. On the plus side, the character animations are quite smooth, and it imparts some of the "yeah, I'm a real hero" feeling that is sometimes lacking from the regular "I throw a fireball", "I shoot a gun", "I hit the enemy with my fists" that feels flat and lifeless. It's no Ninja Gaiden or God of War, but it does feel a little more potent than contemporary MMOs. This is a little bit offset by the fact that it feels somewhat slow when you run, and the silly looking jump animation that looks like it's pulled straight from WoW. That said, my Jedi did do a nice looking tumble roll when he fell from a significant height, which was a very nice touch. It's an MMO. Don't expect Crysis 2 tech here. In general story-telling and quest flow, you can feel the "BioWare formula" coming through. It feels like a BioWare game, with the dialogue wheel, characters building you along the way, and leading you along the "individual journey" that their games typically manage well. This does come across a little strange I had people telling me "you're the most talented person we've seen in years" only to see other Jedi Consulars running along the exact same paths as me... this did shatter the illusion of my character being "special" as I was being told, knowing that all these other players were being given the same speech. Perhaps this problem was exacerbated by having so many beginners at the same time, but it felt as though it weakened the narrative a little. 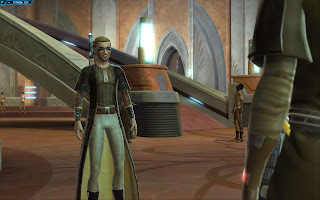 The writing still seemed quite reasonable, though I confess that once again I was put off the Jedi order by a "love is evil and leads to the dark side" sidequest. That said, the voice acting is very good across the board, though I really do wonder how necessary it is. Some players were commenting how it drew them into the game a lot more and that they actually paid attention to the story, which is obviously what the designers were aiming for. I lost count of the number of times I was in a group in other MMOs were quest dialogue/overviews were skipped, and eventually I began ignoring them myself because trying to follow the story was already a lost cause. I briefly got to play in a group, which was a really nice touch, as each player got to say lines of dialogue (though I wasn't clear on how the game chose WHO would speak) within the conversation. This actually really made it feel like you were in a party and pushed that social aspect forward. 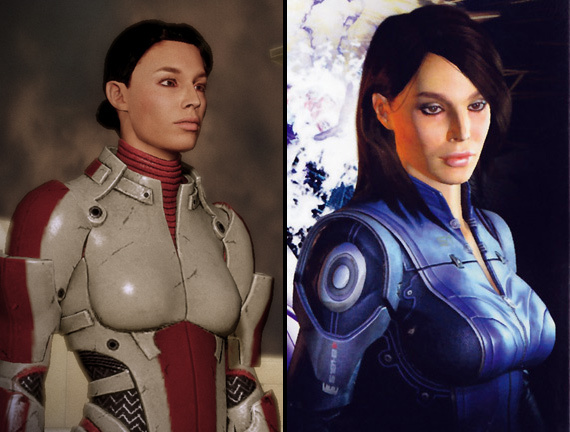 The NPCs also emote and have the facial expression variance that has become a staple of BioWare's titles. While they're talking to you, the characters do a good job as virtual actors. Now the big one: gameplay. Well... it's an MMO. If you hate MMOs, this probably isn't going to change your mind. Combat is not automatic - if you want to attack, you have to push a button and keep pushing them until your enemy is dead. Living in Australia, I thought this might be somewhat problematic given a beta stress test weekend and having to connect to a server on the US West coast. I was pleasantly surprised to find that lag was not a significant issue at all, and that I could quite comfortably manage to play with only a couple of lag spikes. I seemed to be getting better performance than some other US players. To start with it felt like the standard "mash button until enemy is dead" gameplay of MMOs, but I did pick up a few abilities near the end to perform stun and lift (crowd control), so it did seem as though the variety of skills and tactics to use would increase as I increased in level. There was a sense of "I've been here before" that I couldn't quite shake, but it seems like the so called "advanced classes" will allow players to pick different roles (tank, healer, support, DPS) based on what is necessary for the group they're travelling with. It's hard to tell whether this will lead to people trying to be a jack-of-all-trades or pursuing particular specialised roles as characters reach higher levels. The usual MMO problem of backtracking is no less present in TOR than any other MMO, although they have tried to lessen the impact through liberal use of "quick transport" options - speeders that will get you from one location to another for a minimal fee. This does help alleviate the dull "run back to the quest giver" chore that plagues many MMOs, but without removing it entirely. Creatures spawn regularly and populate the map in large numbers, but in some cases it is possible to pass them by without fighting if you're just trying to do a return run. Side quests also become available when you're about to head to a new area for your class "main quest", meaning that you easily polish off a few quests in one trip, making it feel more productive and heroic. Additionally, the classic grind quests of "kill 65,340,285 boars" are mostly relegated to "additional objectives" as part of other quests. This is a nice touch in that the grind feels as though it's optional, and for the most part you'll likely end up killing the required number of creatures as a matter of course in trying to achieve the core objective of the quest. As an overall experience, it seemed reasonably fun, though I do feel as though it would have been far more enjoyable with a group. It really did seem as though group play would feel a lot more rewarding, and going solo somehow made it feel as though you were missing out. I'd be interested to see how different the experience is in that case. The other issue is the concept of choice and the light-side/dark-side within the game. I didn't see any real consequences as a result of previous choices I'd made in my brief journey, but I'm not sure that I can necessarily expect that in such a short time frame. The light side points I kept gaining (yeah, yeah, I was playing a goody-two-shoes, deal with it) didn't really seem to have any great benefit. I was told by the in-game help that certain items would require me to have a certain level of light side points in order to equip, but if that's as far as the system goes, then it feels a little... "gamey". 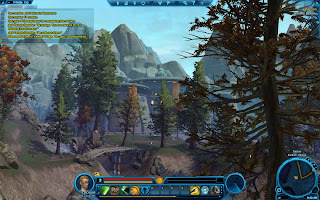 So, Star Wars: The Old Republic - it's an MMORPG in the Star Wars universe with an increased focus on story. It had a feel similar to the Knights of the Old Republic games, and that's by no means a bad thing. How it will translate into a fully-fledged release will be interesting to watch, but it is definitely an MMO to keep your eye on. Game difficulty can be one of the more challenging aspects for designers. Make the game too easy and players will complain about it being too simple, short or dull, but a game that is too hard will likely be called stupid, imbalanced or poorly designed. While I've discussed aspects of managing difficulty previously, perhaps one of the most vital aspects is to make sure that the difficulty matches the expectations of the player. In this case, I'm going to pick on the somewhat older title of Need For Speed: Shift. I'll say upfront that I've mostly enjoyed playing the game and its sequel, but it would be remiss of me to not identify the issues that they have. I'm sure I've complained about rubberband AI in driving games before, before Shift goes one step further. It has several mistakes when it comes to difficulty. 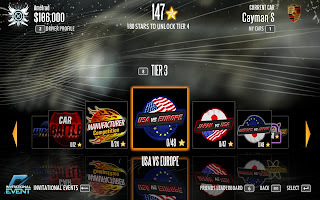 Firstly, in order to unlock new "tiers" of racing (ie new cars and races) you have to gain a set number of "stars" by achieving certain placing, point total (which you earn through certain driving actions: mastering a corner, overtaking, trading paint, drifting, drafting, etc), or another bonus objective. However, if you complete all of the stars from tier 1 and a couple of the associated "invitational events" that you'll unlock by doing so, you'll not only unlock tier 2, but also tier 3. That's right, before you've even done your first race in the second tier, you'll have already unlocked the third. Now I'm all for rewarding players for being thorough, but this is just ridiculous. To unlock the third tier so early is like dangling a carrot in front of someone on a 100m long stick. If someone is going through and doing all the events (and let's be honest here, a lot of players are going to do just that), then awarding them the third level of racing before they've even done the second is just ridiculous. If that's all the game did wrong in terms of difficulty, I'd be happy to leave it at that. Shift has mild rubberband AI, in that it is present, but it's not as blatant as exists in some other driving games, or even other outings in the NFS series. It instead falls into the trap of difficulty scaling. Having just gone through the process of winning every race in tier 1, I found myself with a substantial amount of cash. As such, I decided to put my money to work in buying a shiny new Porsche, top of tier 2, and invested in a few upgrades to put myself further on top of the newfound tier 2 heap. I jumped into a mixed (tier 1 & tier 2) event and expected this new wonderful car to breeze to victory. Couldn't be easier, right? Wrong. Suddenly I was competing against people with equally fast and upgraded driving monsters, but I was the only one struggling to cope with the fact that this new car was a lot faster than the old one. Everyone else handled their new high horsepower beauties perfectly. 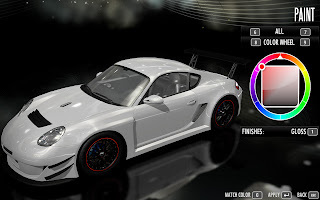 Dismayed, I decided to shelve my new, shiny, uncontrollable Porsche in the garage for a spell, and spend a few thousand on some upgrades for my S2000 and see how it fared. At least if I lost to the competition, I could attribute it to their much faster and more powerful cars. So I jumped into the race with my old favourite... and found myself getting to the front of the pack with only a mild amount of difficulty. Alas Porsche, back in the garage you go. I thought I'd positioned myself to destroy my opposition by spending my money on a top of the line vehicle with a whole lot of bells and whistles, but all I did was get the computer opponents to scale up with me. Any sense of accomplishment was lost when they came right along with me despite me feeling like I should have a superior car. Dropping back to a worse car and seeing my opponents scale down with me turned me off my new car even more. What should have been a triumph instead ended up feeling like a tribulation. This does present a difficult problem specifically for the racing genre, in that each race should be challenging (for whatever definition that might have based on the player's chosen difficulty level), yet in a career mode, the player should be given an increasing difficulty curve with manageable spikes periodically. Of course, it could be argued that any particular sequence within a level of an FPS/RTS/RPG. Would it hurt to let the player of a racing game have a rare romp where they blitz the opposition by a vast margin like some firefights in an FPS are straightforward, or to have one really challenging race every now and then like an RPG boss fight? Racing games quite often manage the latter, but very rarely give a player the satisfaction of the first. As a closing note, I should state that Shift 2 does make an attempt to address these issues, but isn't without its own shortcomings. The main issue retaining the concept of assigning cars a class based on an arbitrary point value based on various handling aspects of the car. While this makes sense, it's possible to have two cars with the same point value where one is vastly inferior in virtually all circumstances to the other. Admittedly given it's pitched more towards the sim end of the market, that's arguably fair enough, but it still sometimes misses being fun.. Yes, I have a confession to make. 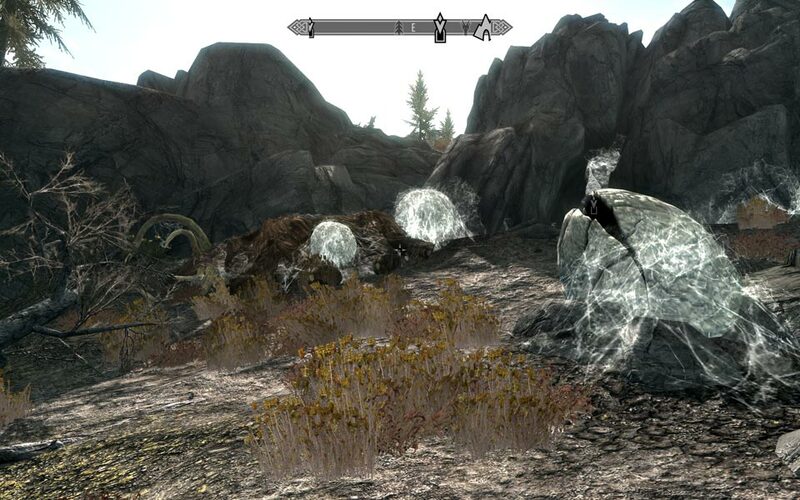 From last Friday until tonight, my modding efforts were completed put on hold due to one main reason: Skyrim. The latest installment in The Elder Scrolls series is nothing short of spectacular, and this incredible game and gameworld make for a supremely engaging experience. After 40 hours of playtime and I still feel like I've only scratched the surface of the game. 1. How do I close the inventory of the chest I just looted using the letter "E"? Oh, "tab". Right, how obvious. It would have been handy to have something on the interface tell me that. 2. Why am I assigning something to my right hand with a left mouse click (which pops up a little "R" symbol) and to my left hand with a right mouse click (which pops up a little "L") symbol. Small complaints, yes, but they were annoying to contend with in my first couple of hours of the game. Despite this initial confusion, you do quickly get used to these and the world of Tamriel is more engrossing and believable than ever. I was complaining about something... oooo, that's pretty. One thing that Bethesda do very well is learn from past mistakes. Oblivion did away with Morrowind's horrible abomination of a journal, added fast travel ("purists" can complain all they want, but it does make the game more enjoyable) and overall reduced the inaccessibility of Morrowind by making it slightly easier to not get yourself killed with remarkable ease at lower levels. Of course, Oblivion wasn't without its own issues, but again Skyrim pushes the series forward. The levelling system is much improved, removing the asinine necessity to level up secondary skills in order to make sure you can increase your attributes. In fact, the only attributes you have to worry about are magicka, health and stamina. While this might seem like a simplification, the introduction of skill perk trees more than makes up for this change, and actually enables far greater depth of character development as you pick which skills you want to pick perks for. While the combat still feels a little clunky at times, it's definitely improved over Oblivion, and the ability dual wield weapons and/or spells is a nice touch. Also gone is Oblivion's creature levelling system - meaning you can encounter creatures that you can decimate... or those that can decimate you. There still appears to be some levelling in place, but the system is much more refined, and you won't suddenly find yourself beset by bandits decked out in full glass armor all the time. There's nothing quite like the wandering and exploration aspect of an Elder Scrolls game, and in this aspect Skyrim delivers delivers in spades. It's hard to convey the sheer size and depth of content in this world, and you can quite literally spend hours wandering around getting sidetracked on one quest or another. As I was trekking towards a distant location, I happened across a pilgrim on his way to a shrine. He marked the location of this shrine on my map... despite that it was a significant distance away, I took the next turn on the path and decided to beat him to the shrine. The creatures also mean that the exploration is never dull, for you never know when you suddenly might be attacked by an angry bear, a troll, a group of mammoths and giants, or even a dragon. Better yet is that even if you're outmatched, you can still decide to run away and live to tell the tale. This only adds to the sense that the world is "real" and that while you might be a hero (or anti-hero), you don't have to try to stick it out against ridiculous odds... or load up that save in order to go somewhere else. Why do I get the feeling that going into that cave is a very bad idea? The individual stories and quests that you encounter are quite interesting, and there are plenty of them. You'll get dozens of miscellaneous tasks very quickly from just talking to strangers, and other sidequests are plentiful as well. There's 70 voice actors instead of the dozen in Oblivion, which is so overwhelmingly welcome. Though facial expressions are still lacking, characters come across as quite believable and you generally don't care too much when you're caught up in the act of exploring the world and the lives and troubles of everyone in it. The world feels so much more compelling than Oblivion, although it does feels as though it lacks the visual vibrancy and variety of Oblivion... though that might be in part because it snows so damn much, or at least is has for me. You won't, however, be trekking through dungeons and get that tedious feeling of "I've been here before" as you did with Oblivion. Other developers and games should take heed here - yes, Dragon Age 2, I'm looking at you. Drawing another area where Skyrim excels (and Dragon Age 2 failed) is the continuity of the setting. This is something that the Elder Scrolls series and Bethesda are very good at delivering. Every previous game gets rolled into the collective history of the setting, with events sometimes set in motion due to previous games, or ideas and threats that are mentioned in previous games come to light in subsequent titles. The extensive library of books within the game carries over some titles that were present in past games, but there are still a joy for lore-loving players, old and new. You can read about the Nerevarine (Morrowind) or the Hero of Kvatch (Oblivion), and delve into the history of figures in those games or who have played roles in the history of Tamriel outside of the games. 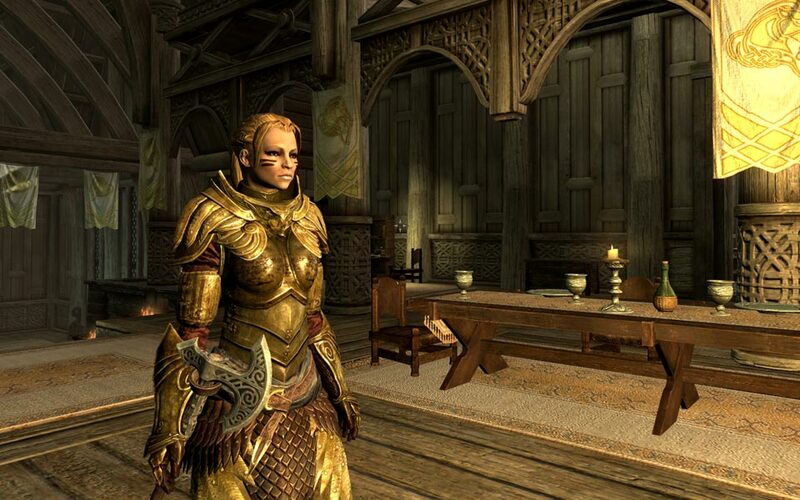 Despite the fact that hundreds of years have passed between Oblivion and Skyrim, the two games feel far more connected than the dozens of character cameos in Dragon Age 2 ever managed. Even a major character like Anders didn't provide continuity, and not just because Adam Howden wasn't as good as Greg Ellis. 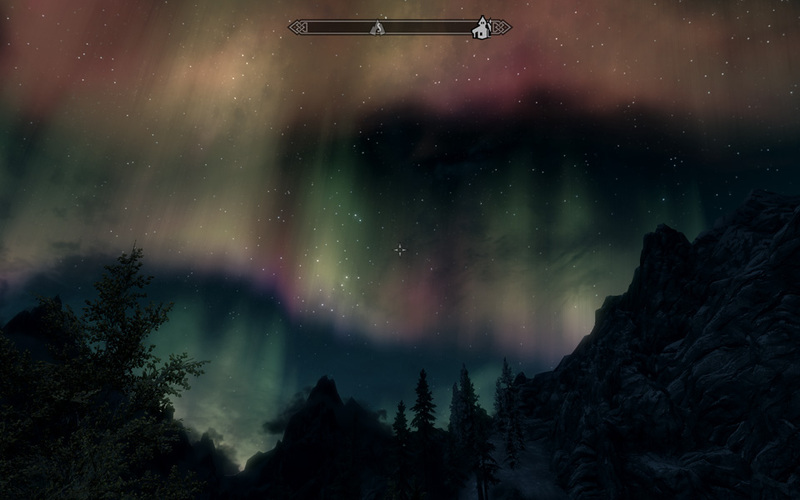 In Skyrim, you might be a hero, but you still get the sense that you're a hero in a vast and vibrant world. When a sandbox delivers that, you know it's done well. If you've never played an Elder Scrolls game before, Skyrim is an incredible place to start, and if you've tried previous outings, it delivers more than you've faced before. If you're looking for the freedom to explore a fully realised fantasy setting, there's nothing else that comes close to delivering what it can. While there can be some bland visuals (or the occasional glitch) and there are some quest bugs, it's hard to imagine that a game this size could come without them. It doesn't seem to deliver an epic story-telling masterpiece (though I confess I haven't finished the main storyline yet), but that has never really been the highlight of Elder Scrolls games. There have been some really nice moments, but where the series excels is letting the player tell their own story. It's about the player's collective experiences and tales as they travel through the world, and this is where Skyrim is nothing short of sublime. If you at all have an interest in this sort of game, do yourself a favour and go out and get a copy. You won't regret it. Skyrim is not only the best RPG of 2011, it's the best game of 2011. With the final installment of the series, Modern Warfare has finally given up all pretenses and shown the true colours of its campaign "story-driven" experience. This explosion-packed ride doesn't let up for the few hours it'll take you to finish it, and ultimately still ends up falling short of the heights of the original game. It is an improvement over the utterly ridiculous MW2, and I think a little bit longer, as I polished off the campaign of Modern Warfare 3 on normal difficulty in a little over 6 hours. I have to say that it was an enjoyable ride, but at the same time you love it in the same way that you love a trashy blockbuster action movie. It's lightweight, plot-negligible, with one-dimensional explosion after chase after fight continuity... but provided you're willing to switch off your brain and just enjoy the ride, it'll be a lot of fun reaching the end. As the post title implies, it's like a Michael Bay movie presented as a video game. I found there were a few things that grated on my nerves, which is the reason for this blog post. There won't be any real spoilers here, but if you really want to make sure you don't spoil anything (you don't really need to worry though), then you may want to stop reading here. 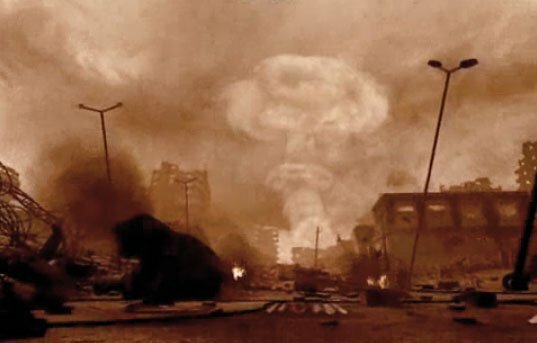 When MW3 doesn't know what to do, it puts another big explosion on screen. When there's lots of action, people will overlook the absence of a plot, right? There never feels like there's any continuinity in the plot and that the loosely constructed story is merely a contrivance simply to provide a vague means to justify having explosions around famous cities. 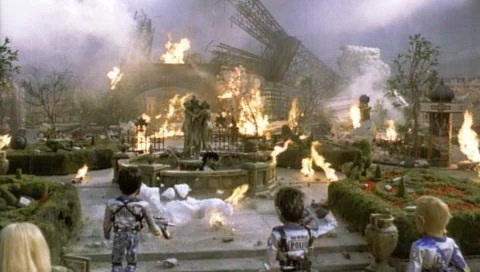 There's even a Team America moment where America levels the city that they're supposed to be saving. I'm not joking here. In what was most likely meant to be a serious "wow" moment or have some sort of impact on the player, I was laughing uncontrollably and found myself singing the movie's theme song. The issue here is pacing. 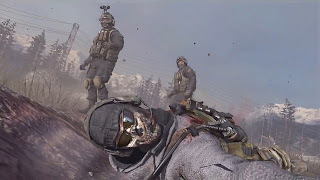 MW3 has a frenzied pace that barely lets up for even a couple of minutes, and even the most avid UT2K3/UT2K4 speed adrenaline junkie will potentially find themselves feeling overwhelmed by the constant action. Worse still is that fact that because of this pacing (or lack thereof) those moments that should feel like an amazing high end up just feeling like a regular part of the experience because the player is never given a reprieve from the guns, bombs, exploding buildings and dying protagonists. This isn't to say that it needs to attempt the "lull" sections that felt quite forced in Gears of War 1 & 2 to provide this necessary respite, but MW3 sorely needed something to break it up. As we've come to expect from Modern Warfare, characters die. 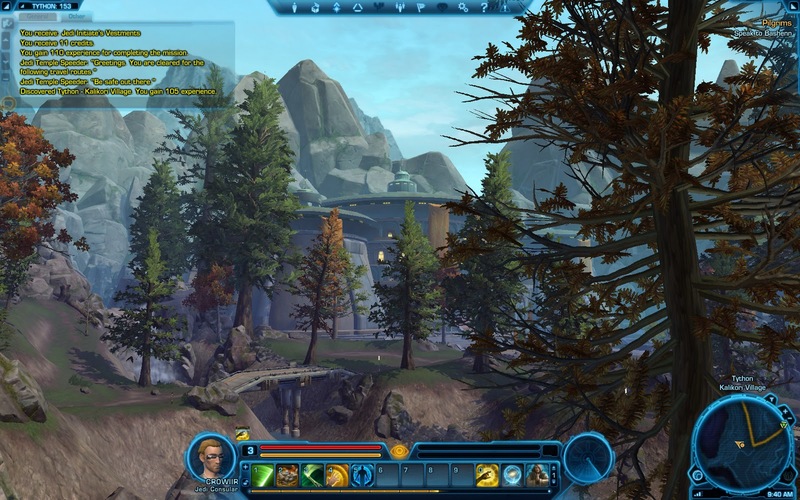 Not just enemies or allies, but the characters that the player is playing. Just like with Modern Warfare 2, this happens on a fairly regular basis. There are fewer instances where you "almost die", which plagued the second installment in the series like a bad smell, but again the variety of characters means that you never care about any of the people you're playing. They're just as emotionless, faceless and lacking in character as the hundreds of enemies you slaughter on your way to victory. There is only one death that actually matters, but even while I was lamenting that particular character's death, I realised that the only reason that I cared about them was because of their presence in previous outings of the game. That's right, MW3 does effectively does nothing to make you care about previous characters - it just expects you to come along with an attitude of: "you care about that person because they were in the previous games". You hit the button to complete an objective, and before anything else happens, "Objective failed" pops up at the top of the screen. Instead of showing you what is going wrong, you're immediately and definitively told "A Bad Thing Happened". The simple axiom of "show, don't tell" could not be more apposite here. Don't tell the player with a simple message that something went wrong, show them with the cutscene which is shown right after that message. Get rid of the message entirely, and not only would nothing be lost, but the scene would be a lot more effective. You still wouldn't care about the character's inevitable death, but at least the sequence would have some impact instead of none. Contrast this with a later situation where you're trying to retrieve someone, and you see them taken away on enemy helicopter just as you arrive. There's no "objective failed" message here, just the sequence where you can fire at a few guards and then get maybe one or two rushed pot-shots at the captors before it flies off. That actually made you care about it and felt like it gave you some freedom, even though it didn't have any more than the previous example. It's not about what happens, it's about how it's presented to the player. As I said at the start, MW3 is by no means a bad game. I'm sure thousands of people are diving into the spec ops and multiplayer (though I must confess they don't quite hold exactly the same appeal to me), but given the campaign was being billed as a great adventure, I can't help but feel like the second and third games came up well short in trying to live up to the success of the first. The series is good for what it is, but you can't help but feeling that with a little more understanding about pacing, emotion and how to write a plot that makes sense, that the campaign across the three games could have been excellent instead of merely an enjoyable action outlet. I must confess that since finishing it, I've sunk far more hours into Skyrim... which I might provide a few thoughts on in my next post. Steve Jobs is the "most influential person in gaming"
Stop. Stop. Stop it. Stop it right now. This is rubbish. I will not argue that the iPhone has had a significant influence on the gaming industry in recent history, and has led to a vast increase in games on smartphones and other mobile devices (though remember it's not just iPhones now!). If anyone thinks that Steve Jobs was the most influential person in gaming, then they're an idiot, and I expect a more intelligent response from attendees at a gaming conference. I apologise for ranting here, but it really is that simple. Steve Jobs had a great influence on the technology industry, but his involvement in the gaming was indirect at best. If you want to applaud someone, applaud those developers that jumped on board and made products for smartphones, applaud the people who worked out how to integrate accelerometers and touch screens into enjoyable gaming experiences, applaud the people who are actually in the gaming industry and not someone who marketed products that others realised could be used for gaming. Macs were laughable as gaming devices for decades, and the iPhone only became a gaming device because of the work of talented and imaginative developers, so crediting Steve Jobs with this kind of praise is outright insulting to all the people who have dedicated their lives to the gaming industry. To all those who voted, I have one thing to say: shame on you. 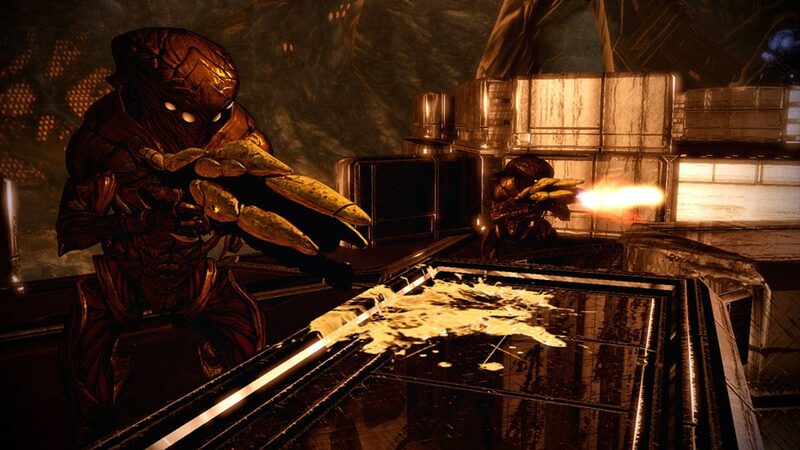 An early version of the Mass Effect 3 beta was accidentally released to players for a short period. While this got people all excited, some of the options available disturbed quite a few fans: modes referred to as Action Mode, Story Mode, RPG mode. 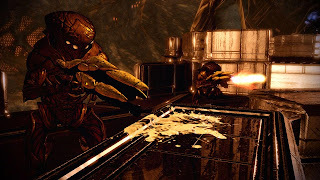 The essence is that "action mode" would see all dialogue occur without player input, and the Story Mode would make combat trivially difficult for those who have difficulty with the shooter gameplay and are just in it for the story. RPG mode would give "the definitive Mass Effect experience" in line with the content of the previous two games. As I declared my worry in a previous post, this seems as though it's trying to garner new fans, but can we really expect many people to pick something that effectively removes the aspect of choice or the combat gameplay when those two combined features have basically been the selling point of the series? It's too early to tell, but this seems to be an effort to "please everyone", which far too frequently ends up pleasing no one. Next is the news that the first Gears of War 3 DLC was shipped on the disc that everyone bought. Logically and from a business perspective, the argument for this decision makes complete sense. In a nutshell, the release date was pushed back by several months in which time developer of the DLC was finished, so to save players a forced download (because even people who don't have it will need it) they put it on the disc. Somehow this doesn't sweeten the deal for players who now know they already "possess" that content, they just have to pay in order to use it. I'd like to discuss DLC distribution and practices at length in a future post, so I'll leave that for now. For the meantime, imagine if Epic had decided to release this content for free to everyone. I'm not sure why the release was delayed in the first place (was it going through certification? ), but if the only reason was to extend the life of the product, to force people to wait and then pay for content that was already sitting on the disc seems like a poor PR decision to me. This worked. Modern Warfare 2? Not so much. Now this one I'm genuinely excited about. Having recently finished Red Dead Redemption, I might be on a bit of sandbox overdose, but The Elder Scrolls series are typically filled with so many little sidequests and story based diversions that it is still possible to gorge yourself on plot-driven gameplay. Players will be relieved to know there are 70 different voice actors for Skyrim compared to a mere 12 for Oblivion, so hopefully you won't be hearing exactly the same few voices over and over again. The little snippets I've seen thus far have looked promising, so I'm hopeful that it will deliver many hours of interesting and varied gameplay. This will definitely jump to the top of my playlist for my gaming between modding sessions, I'll just have to be dedicated enough to make sure it's not the other way around. I have a love/hate relationship with sandbox games. I love the unbridled freedom that a sandbox offers, and the ability to become completely immersed in and explore a setting. A well designed sandbox can frequently deliver a setting with more impact and depth than a linear story ever can. Yet this freedom is often a blessing and a curse, for that exploration can end up feeling like a chore rather than the excitement it should be. Having to spend lengthy periods of time "doing the commute" rather than just "having fun" often makes these games feel less enjoyable than they otherwise might. This is rather a double edged sword, because sometimes that commute can be the very thing that exposes player to random events within the gameworld that truly make it feel alive. The potential increases vastly if you're one of those people who like to make sure they've "experienced everything" and try to go for those "100% completion" statistics. I've never bothered to even try for one of these. I never found any appeal in hunting for packages, pigeons, nirnroot, flags, feathers or any of the other countless tedious efforts that always seem to plague such endeavours. That is, not until Red Dead Redemption. For once, I found myself with the dedication to achieve that "100% complete" goal, and for the most part, it was actually quite fun. What is it about Red Dead Redemption's "grind" to achieve this goal that made it seem much more attainable and enjoyable than previous equivalent outings? Simply put: variance. In order to obtain this completion, greater emphasis was placed on making the means to do so more varied and complex. Completing the core quests of the game will give you only about 60% of the "total completion" for the single player game, yet most players are likely to have more than that by the time they reach the game's conclusion. This is because the task is far more enjoyable than hunting down 100 pigeons in varies nooks and crannies hidden around the gameworld. It consists of numerous other tasks: obtaining rare weapons, completing gang hideouts, completing jobs, being a bounty hunter, story "side quests", exploring the gameworld, buying safehouses, obtaining outfits, winning minigames and completing "challenges". With this assortment of tasks, the player always has something different to tackle in pursuit of this goal. Even better is that as the player progresses towards this ultimate goal, they are given numerous rewards along the way. 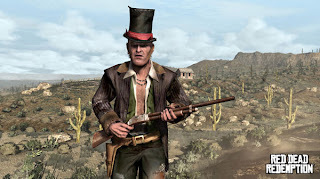 The four "challenges" (hunting, survivalist, sharpshooter and treasure hunting) each provide the player with different bonuses at the halfway point and upon completion. Many of the 13 available outfits provide different advantages to the player. This system of continual reward gives the player a sense of achievement during progression on par with the best skinner box motivations used by MMOs and levelling systems. The player is rewarded along the way, giving them further incentive to keep persevering with the grind. In addition, some of the tasks required can be completed simultaneously, either directly or indirectly by facilitating completion of other goals. To unlock a particular outfit, you may need to win at one of the minigames, which will contribute to that aspect of completion at the same. Also, you may need to collect a particular flower, which is located in the same region as an animal you may need to hunt, or a treasure you have to find. What a great way to score some hatshots! 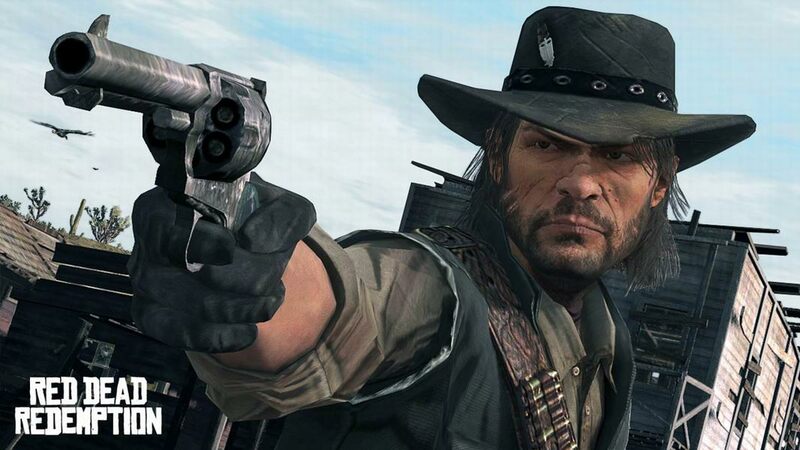 Ultimately, RDR makes the goal of 100% completion seem not only achievable, but also as something that can let the player feel like they have "achieved everything", at least as far as the singleplayer component is concerned. There are a handful of achievements/trophies that will not be collected as part of this experience, but the player will definitely feel as though they've gained most of the game's virtual rewards as well. Providing a clear end point means that people wanting to pursue such a task will not be left with that feeling of "just a little bit more" that so frequently preys upon those playing MMOs. Moreover, it's not a stupendously inane task requiring an utterly barbaric level of dedication like Gears of War 3's "Seriously 3.0" achievement. Sorry Epic, but that's just plain stupid. There's no other word for it. I don't imagine I'll end up any more dedicated to the task of 100% completion for future sandbox games, but if designers are looking for a method by which to motivate players to pursue these kinds of virtual goals, then Red Dead Redemption provides an excellent template by which to encourage this kind of perseverance. I've recently been laid up with an injury and been unable to sit a computer for more than an hour or so. As a result, I've spent quite a lot of time playing games on my XBox360 rather than modding. Among other gaming, this led me to finish my Mass Effect 2 insanity playthrough. This difficulty level requires a little more patience and skill than lower difficulties, and there were a few segments I had to replay more than once. Now, I have no problem with this, but it did get me thinking about how this difficulty level was affecting the gameplay experience. If I'm tackling a boss fight a half a dozen, a dozen or even more times in order to defeat them, then I'm getting a great sense of accomplishment from the final success, knowing that my skill is sufficient to overcome the difficulty. The challenge of the battle and the triumph in overcoming that difficulty gives the player that empowering feeling of "Yes, I did it!" The thing I'm not quite so sure about is whether that actually helps the feeling associated with the end of the game and the climax that should come from the completion of the ultimate challenge to bring a game to its conclusion. 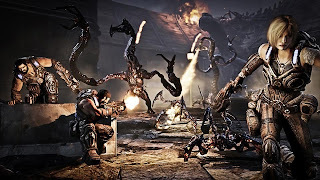 Having recently finished Gears of War 3 co-op after numerous retries on the final battle, the victory felt both liberating and hollow given my friend and I realised we had come "this close" on a number of previous attempts. No, this isn't the final boss. No spoilers here. The issue I found was that it felt like the difficulty was clashing with the narrative of the story. Admittedly, the immediate counter-argument is "l2play n00b", but that's hardly intelligent or helpful. The sad truth is, it's probably accurate and the best solution to the problem. The more focus is given to the story of the game as progress between gameplay segments, the more each failure on the part of the player will "get in the way" and have the potential to negatively impact that part of the experience. Getting meaningful narrative into gameplay itself is extraordinarily difficult, so unless repeated failure is part of the gameplay or narrative mechanics, those gameplay failures translate into the story feeling weaker. Unless the player gets better, they're going to enjoy their achievements of gameplay success more than the story, because that's where all their effort and energy is being expended. Commander Shepard is a galactic hero... who has died several hundred times on the way to the end credits. Yeah, that's the stuff of legend. Counter-intuitively, the greatest feeling I got of being an epic hero was when I was getting through segments by the skin of my teeth. Barely surviving tense firefights, especially where I'd done something ridiculously brave and stupid but somehow managed to come out on top, that was the epitome of Commander Shepard's achievements - overcoming insane odds to save the day. Having a difficulty to punish you if you repeatedly do something stupid and incompetent was good, but not something that would bitterly punish every single mistake with near or actual death. I'd suggest that this is why games like Ninja Gaiden and Demons'/Dark Souls don't rely heavily on plot but on gameplay instead. If they did, everyone would go insane from the brutal difficulty, and/or end up ignoring the plot anyway because it would be delivered far too infrequently for most people to actually keep track of it. The thing is that I love the sense of achievement from beating ridiculously hard games. I'll fight hard to learn how to cope with those tough as nails fights in games, and spend hours of frustration trying to get past that next sequence. While I love an enjoyable romp where I can casually do ridiculous things and still dominate a horde of opponents (this is what makes the repetitive gameplay of Dynasty Warriors so mind-numbingly enjoyable), I'm happy to harden up and go for the tough battles, even if I eventually have to admit defeat. (Curse you Modern Warfare's Mile High Club) Is it possible to have a ridiculously hard gameplay experience that requires countless defeats sit well with narrative? In rare circumstances, it is. Both Planescape: Torment and Braid expect and demand failure in order for you to reach the end goal. These do, however, utilise very unique gameplay and narrative techniques to achieve this goal, ones that can't easily be replicated across different genres and settings. I remember reading articles about people playing Dragon Age who felt they had to drop the difficulty to "easy" in order to gain enjoyment out of the game, because they found the fights too challenging for their party. This led to them feeling stupid and not enjoying the game because they were there for the story and their constant defeats were getting in the way. There was also the tale of another DAO modder who stopped playing The Witcher 2 because of similar difficulty woes. Such difficulty is hardly the way to get players involved in the complex setting, characters and plots of a story driven game. L.A. Noire even went so far as to offer the potential for players to skip action sequences altogether if they failed repeatedly. Unfortunately, many players took this as a severe slap in the face, as though the designers/developers were telling them: "Sorry, you're really bad at this. Let's just pretend that you succeeded, shall we?" Many then spent persevered until they finally succeeded, just so they could have the pride of saying "I did it!" What if, instead, the game had just invisibly dropped the difficulty to allow the player to succeed? Then they'd have the feeling of accomplishment without feeling insulted beforehand. Or did perhaps proving that they were good enough make that pain worth it? That's a question I can't answer.